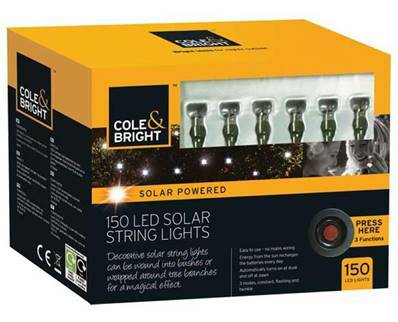 The 150 Solar LED String Lights from Gardman are excellent for brightening up bushes, trees and garden features. Having 150 LEDs with 15.9m of cable, will allow you to create an impressive outdoor display. These lights also feature triple functions; Constant, Flicker and Flash modes. The lights are solar powered so charge during daylight hours and automatically switch on at dusk and off at dawn. Great for events such as weddings, parties and Christmas celebrations, they are wonderful for providing subtle night time illumination in your home or garden.